If you’re salivating as much as we are as we think about the gorgeous new Ford GT, then you’d better put in your tickler file to Save-The-Date for ordering! Available in 2017, the Ford Motor Co. just announced it will limit production of the supercar to 250 a year and will price the mid-engine car competitively with the Lamborghini Aventador, starting at a cool $400,000. 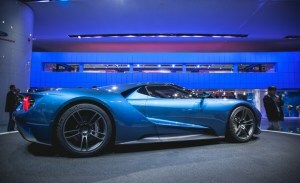 Ford debuted the stunning, new GT in January at the North American International Auto Show in Detroit to acclaimed reviews. The supercar boasts more than 600 horsepower from a 3.5-liter EcoBoost engine and begins production in 2016. 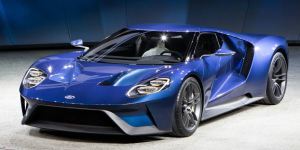 Ford built the original GT in the mid-2000s and produced just over 4,000. The price on those beauties? Around $140,000 to $150,000, if your lucky — depending on when and where the price goes up from there. So if you’re like us and you JUST CAN’T WAIT….and maybe others are sick of hearing about it, gives us a call — we are always in the mood to talk, listen, and drool over the photos of this amazing work of art! « Generation Z Buyers Love Fords!